it is challenging! you definitely need blue. I worry about contrast more than color myself. Color gets all the credit though. 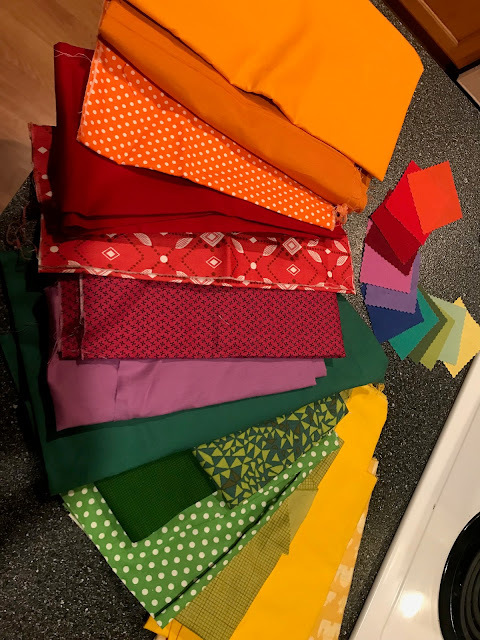 That looks like fun - to choose fabrics for a surprise project. This looks so interesting! I'm surprised you don't have blue? What about that fab cobalt from your cheddar and blue Railroad Crossings quilt? The group of small swatches is inspired, it definitely sets a standard of color wheel assortment. [looks like you need blue-violet as well as blue in your prints]. Your quilts are always wonderfully colored so you ll do great and maybe refine your eye. I think you're doing well, and I like the patterned fabric interspersed with the solids. It adds some interest. The class should be fun. Can't wait to hear what you think of it! My thoughts are that I'm so stinking jealous that you are taking her class! Oh what a dream!! Can't wait to see what think of it. Sounds like an interesting class to take, does she mention anything about also having different values of the colours? As she suggested 12-24 I would pick light and dark values of each colour.. Have fun I think you are heading in the right direction but need some blues, green, purple pink. You do need that something to take place for blue. I would follow the title of the workshop and bring something relatively blue which reads as dark. I agree with Barb, color gets all the credit but it is values that play bigger role. I love that you are going with prints. Enjoy the workshop! Looks like you have a good collection, if you can fill in with some purple/violet/blue ranged fabrics. I would be sunk--I just don't have much solid fabric. Sounds like a really interesting class. Sounds like an interesting workshop! 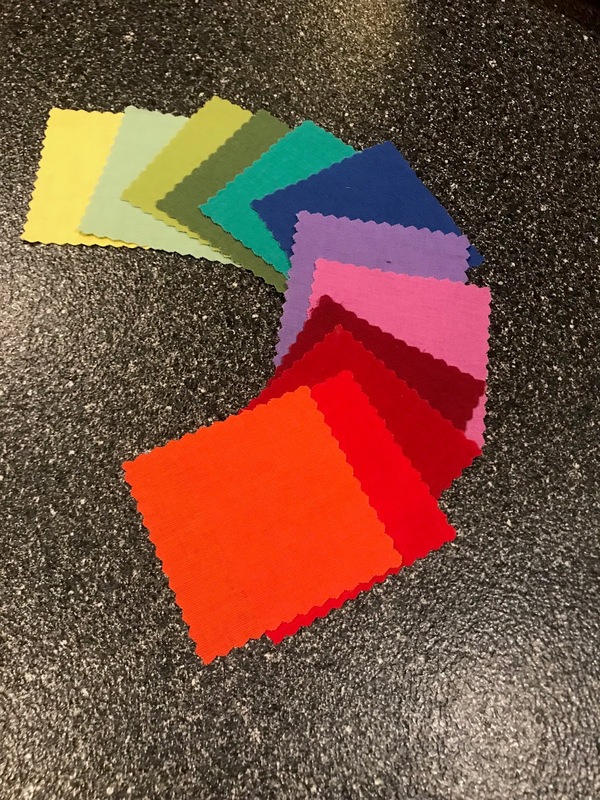 I’m sure you will find it helpful,even if it’s only realizing you don’t buy much blue fabric! Looks great. I think you are right on track, grab some 3-4 values of blues and had fun with it! I think you've done a great job so far, just add in blue and a deeper purple/violet! Sounds like it should be a very interesting and educational class! Have Fun!